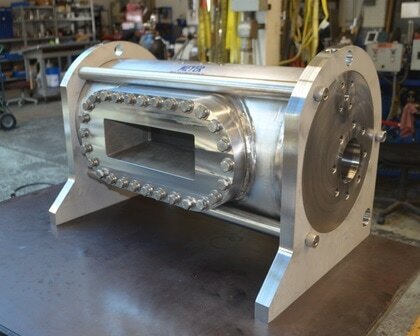 Custom Pressure Vessel Products | Meyer Tool & Manufacturing - Meyer Tool & Mfg. 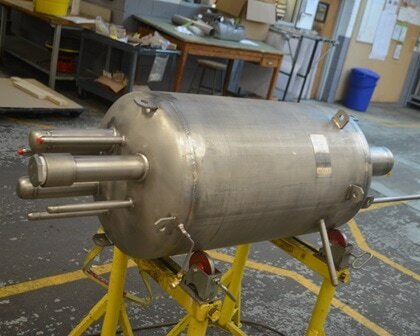 ​We can design your pressure vessel project from scratch or we can build a vessel per your prints and specifications. We maintain an ASME "U" and National Board "R" stamp which certifies us to both fabricate and repair ASME code pressure vessels. 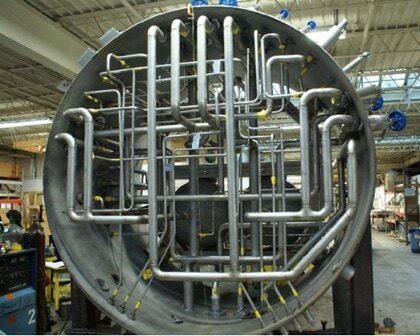 We specialize in custom, prototype, or challenging pressure vessels designs in which we can showcase our differentiated fabrication skills. We are capable of streamlining a one of a kind prototype design, optimizing it for production, and producing mass quantity production runs at impeccable quality standards. Meyer Tool carries an ASME "U" stamp that certifies us to fabricate custom ASME code pressure vessels. Our welders are ASME Section VIII certified per the ASME boiler and pressure vessel code. It is up to the customer to determine if an ASME code stamp is required per their local regulations and insurance requirements. The ASME pressure code pertains to vessels greater than 6" diameter carrying a pressure greater than 15psig. Adding an ASME code stamp requirement will increase the cost and scope of the project. An ASME code vessel has certain design requirements whereas a non-code vessel has more design freedom. Designing a vessel to the ASME code standards provides a certain degree of comfort knowing that the design adheres to specific regulations. Once an ASME code stamp is obtained, the performance of of that vessel is guaranteed and fully insured. It is up to the customer to determine if acquiring an ASME code stamp on the vessel is a requirement. Although we are an ASME code shop we very often fabricate vessels that do not get a code stamp. Sometimes our engineer will design a vessel to the ASME code but we will not collect the additional paperwork or perform the additional third party inspections that are required for a code vessel. Obtaining a code stamp provides an additional level of traceability and insureance regarding the performance of the vessel but it is not always warranted. We can be very flexible and work with you to develop a fabrication plan designed to fit your specific needs. The B31.3 code is a widely used regulation that specifically applies to piping systems typically found in refineries, chemical plants, pharmaceutical plants, textile mills, paper mills, semiconductor process facilities, and cryogenic plants. The code covers different aspects of the materials, designs, fabrication techniques, inspection requirements, and testing criteria utilized during the production process. We are a vertically integrated fabrication facility capable of designing and fabricating your next B31.3 related project.